You are currently browsing the daily archive for March 24, 2015. So far, my series on liturgy and Communion from the early centuries through the Reformation has included early Christian liturgy, that of the East, changes during the Dark Ages, Mass during the Middle Ages, Martin Luther’s liturgy and Zwingli’s rite in Zurich. Today’s post looks at the Protestant liturgy in Strasbourg, which, during the Reformation, was one of the free imperial cities in the Holy Roman Empire. This meant that the city council had more sway over local government than the Catholic emperor of the Holy Roman Empire. This was also true of smaller princedoms scattered throughout this vast tract of Europe, and, although the Empire was designed to ensure Catholicism remained the principal form of Christianity, in reality, the devolution of power enabled the Reformation to flourish. Strasbourg, like other free imperial cities, developed its own form of Protestantism. Strasbourg was close to the Swiss cities which had broken away from the Holy Roman Empire. Its leading Protestants not only borrowed both from Martin Luther and Zwingli in Zurich, they also knew the two Reformers personally. Later, they invited Geneva’s Calvin to the city to help integrate French-speaking Huguenots. More about this later in the post. Unless otherwise indicated, source material is taken from W.D. Maxwell’s 1937 book A History of Christian Worship: An Outline of Its Development and Form, available to read in full online (H/T: Revd P. Aasman). Page references are given below. A year before Zwingli finalised his rite for Zurich, in Strasbourg, Diebold Schwarz (Theobaldus Niger, in Latin) developed a German liturgy. (Alsace was then part of Germany.) He celebrated it for the first time on February 16, 1524 in St John’s Chapel in the Church of St Laurence (p. 88). Schwarz and Zwingli were the first two Reformers to include public confession of sin in church services. Schwarz retained much of the ceremonial aspects of Catholic Mass — e.g. the celebrant’s washing of hands (Lavabo) during the Liturgy of the Upper Room — which made it a meaningful rite compared with Luther’s pared down effort (p. 88). – Nicene Creed, spoken, retained from Mass. – Final blessing, from the Mass. 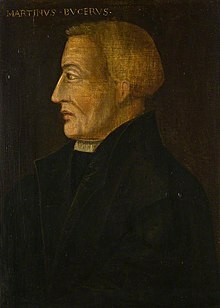 A young Reformer, Martin Bucer, arrived in Strasbourg seeking refuge after his local diocese in Germany excommunicated him. During the years 1524-5 nine or ten printed editions of the German mass appeared at Strasbourg, each differing from the others, but all closely related in form and substance. Bucer largely led a subsequent move in replacing Latin names with German ones for parts of the liturgy and the sanctuary. Eventually, words and terms such as ‘Lord’s Supper’, ‘Minister’ and ‘Holy Table’ became commonplace (p. 91). – He developed various versions of certain prayers, any of which could be used (p. 99): three confessions of sin, three prayers of consecration and four post-Communion prayers. Communicants had to approach the Lord’s Table in an orderly queue to receive the Sacrament. They either stood or knelt for this. The minister distributed the Bread and an assistant minister followed with the Cup (p. 111). By 1537, the Liturgy of the Upper Room was celebrated weekly only in the Cathedral; churches held a Communion service monthly (p. 100). After the service concluded, the congregation ate Sunday lunch. Those who worshipped at the Cathedral returned ‘immediately’ after lunch for another service of psalms, communal prayers and a sermon (p. 110). A children’s service followed to provide them with a knowledge of the Ten Commandments, the Lord’s Prayer, the Apostles’ Creed and the local catechism. In the parish churches, Vespers followed the Cathedral’s afternoon services. Vespers consisted of psalms, prayers and a collect. The parish churches also had four annual day-long periods of instruction in facts about Christianity, the Creed, the Ten Commandments, the Lord’s Prayer, the Sacraments and how all of these related to the believer’s daily life and practice. It could well be that from these multiple services that we have the Protestant traditions — obligations? — of returning to church later on Sunday. Many Reformed churches have this policy. It is obvious that we do not have one and the same spirit. Between 1534 and 1538, Bucer also tried to achieve Protestant unity in the German and Swiss churches. The German representatives signed the Wittenberg Concord, but the Swiss churches never did, principally because of the words used to describe the nature of the Sacrament. 3/In 1538, Bucer invited John Calvin to Strasbourg to lead a congregation of Huguenots who had sought exile in the city. The two became lifelong friends. Calvin adapted Bucer’s liturgy for later use in Geneva. 4/ Bucer eventually had to leave Strasbourg when Holy Roman Emperor Charles V attempted to reimpose the Catholic Mass throughout the Empire. In 1549, the people and the city council considered him more of a liability than an asset, as he attempted to preserve the Protestant church there. He was relieved of his responsibilities on March 1, 1549. He had several invitations from other Reformers for resettlement and accepted Thomas Cranmer’s. He arrived in England on April 25, 1549, and accepted the post of Regius Professor of Divinity at the University of Cambridge. b/ He promoted charity to the poor via the Pauline practice of sending deacons to exercise that responsibility. He also wrote the controversial De Regno Christi [On the Kingdom of Christ], addressed to Edward VI, although it was never printed as the authorities considered it too controversial. Bucer advocated 14 reforms of both church and state. These included a plea for divorce decrees, his reason being that marriage was a social contract, not a sacrament. The document was a step too far for the Church of England. It ended up being published in Basel in 1557, six years after Bucer’s death. c/ Scholars of Church history say that Bucer’s greatest influence was on the early editions of the Book of Common Prayer, at Cranmer’s request. By 1551, the year of his death from tuberculosis, he submitted his response to the Archbishop, advocating a simplified liturgy, a removal of non-essential feasts and practices as well as suggestions for making the service more meaningful to the congregation. Anglicans who know the Book of Common Prayer might wish to read Bucer’s Strasbourg prayers (p. 102-110), some of which are similar in style and content. Martin Bucer is buried at the Church of Saint Mary the Great in Cambridge.